Properties in Asciano average 4.7 out of 5 stars. The apartment met all of our needs and Francesca could not have been more helpful. Location was perfect and close to everything, however, tucked away to be quiet and peaceful. Will certainly return and cannot recommend this apartment enough. What a wonderful place to spend Christmas! 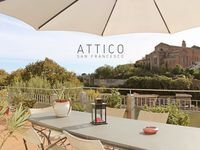 Very early in our planning of a 5 plus month European dream vacation, we found and booked Attica San Francesco. The view is indescribable, it is so glorious. The hosts hospitality and graciousness is beyond compare. They are indeed superhosts. The Christmas tree made our home away for the holiday cozy and charming. Our hosts even made restaurant reservations for us so we had special places to dine on Christmas Eve and Christmas Day. The apartment is large with very comfortable beds. The kitchen is very well appointed with everything we needed to cook with, including spices and oils. A full size refrigerator, with ice trays was an unexpected bonus. Especially for Americans who love their ice! The welcoming items of local wine, typical Siena treats, and breakfast items made our stay exceptional. WiFi was exceptional. Everyday of our week long stay provided wonderful sunrises and sunsets from the outstanding terraces. The apartment is a very convenient walk into Siena. A small, but good grocery store is right down the stairs from the apartment. An unexpected surprise were the cities escalators, an experience that everyone must do. All said, the flat and week visiting Siena is a highlight of our trip. We have Attico San Francesco on our short list of where we definitely want to return to in the near future.